The Niger Delta Avengers early Wednesday morning blew up two oil wells located in Warri South West of Delta State belonging to Chevron Nigeria Limited nigeriamasterweb.com reports. The militant group claimed responsibility for the attack of the RMP 24 and RMP 23 which are Chevron Swamp's highest producing Wells. “With the heavy presence of 100 gunboats, 4 warships and jet bombers, NDA blew up Chevron Oil Well RMP 23 and RMP 24, 3:44AM this morning.”It said via its Twitter handle @NDAvengers on Wednesday morning, “This is to show the whole world that the Nigeria military is good in harassing innocent Nigerians.” the group said. The latest attack comes as President Muhammadu Buhari is expected to visit the Niger Delta region on Thursday for the first time since taking office a year ago. Buhari will visit Ogoniland to launch a cleanup of areas heavily polluted by oil spills. 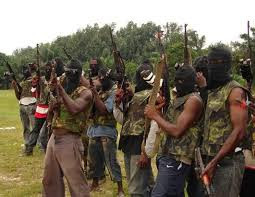 The Niger Delta Avengers militant group, which has claimed a string of recent attacks, issued a warning to oil firms in the southern region that their "facilities and personnel will bear the brunt of our fury," according to a statement. Buhari said on Sunday that the government would hold talks with leaders in Nigeria's main oil-producing region to address their grievances in a bid to stop a surge in pipeline attacks.